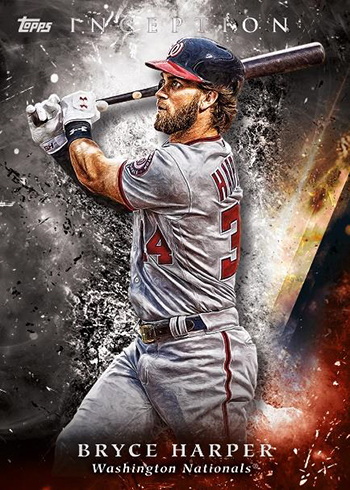 2018 Topps Inception Baseball has the look. It has a checklist centered on rookies and young players. And it’s got either an autograph or autographed memorabilia card in every seven-card box. Basically, Inception is back, only this time in black. Like it has been from the beginning, 2018 Topps Inception Baseball jumps out visually. The design is a mix of modern and abstract. However, this year it takes a much darker approach versus what was used in 2017. This is the second year that Inception has used current MLB talent versus the heavy prospect focus when it debuted in baseball as a Bowman product. That said, the checklist is big on rookies and young players who still have a lot of years ahead of them. 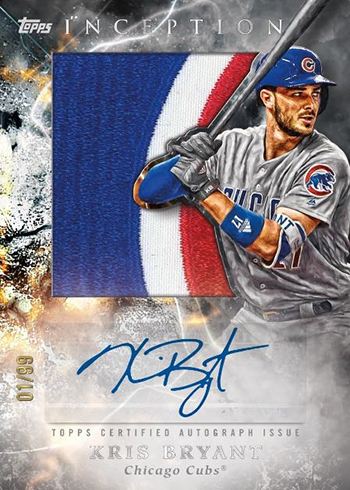 The 2018 Topps Inception base set has 100 cards, four per hobby box. Boxes also have a pair of parallels. These come in Green, Purple (/150), Magenta (/99), Red (/75), Orange (/50), Blue (/25) and Inception (1/1). Base cards also have Printing Plates. Also included as part of the base set are Rookie and Emerging Stars Autographs. All versions, including base, come serial numbered and are signed on-card. Parallels are Magenta (/99), Red (/75), Orange (/50), Blue (/25) and Inception (1/1). 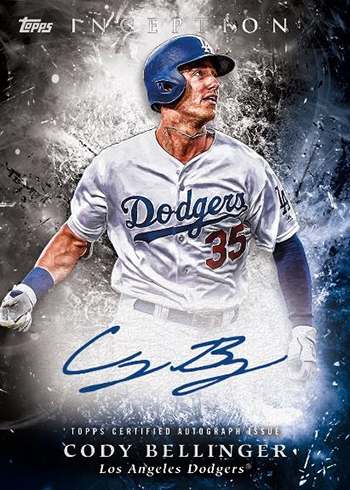 2018 Topps Inception Baseball has a few other autographed inserts. Silver Signings are a case hit that get their name from the colored ink used for the signature. In addition to the numbered base versions, there are Gold (/25) and Gold 1/1 parallels with gold ink autographs. 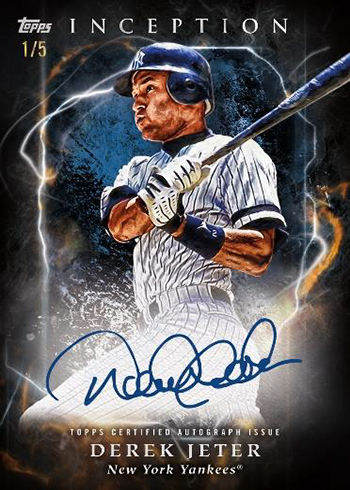 Legendary Debut Autographs (/20) use a design similar to the Rookie and Emerging Stars Autographs. However, the checklist is anything but emerging players. Images come from early in the players’ careers. Parallels are available in Orange (/10), Blue (/5) and Inception (1/1). Current players are the focus of Short Print Autographs. These have just ten copies each, though, so finding them isn’t easy. About every fourth 2018 Topps Inception Baseball has a numbered Autograph Patch card. Youngsters continue to be the center of attention on the checklist, which also includes Magenta, Red (/25), Orange (/10), Blue Button (/6) and Inception Majestic Patch (1/1) parallels. Autograph Jumbo Patch cards are another case hit. These have a design that resembles Panini Silhouette cards, the cards take a layered approach to design. A massive swatch is sits underneath a die-cut image with space at the bottom for the signature. These have three parallels: Orange (/25), Blue (/10) and Inception (1/1). 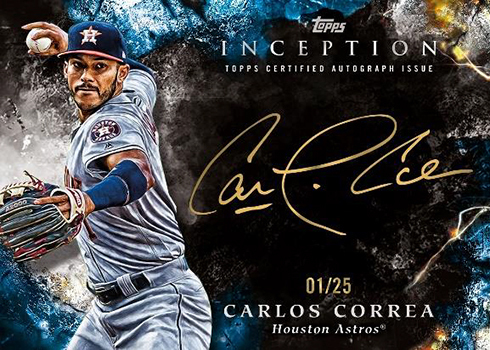 2018 Topps Inception Baseball has some extremely rare book cards that combine autographs and premium pieces of memorabilia. These include Autographed Team Logo Patch (/2), Autographed Letter Book (/2), Autographed Laundry Tag (1/1) and Autograph MLB Silhouetted Batter Logo (1/1) cards.